Your garage: A Hummingbird’s worst enemy? I was working in my yard this afternoon when my next-door neighbor came walking up. She knew I was a bird lover, and wanted to know if I knew how to get a hummingbird out of her garage. It may sound like an odd request to many. However, it’s one I’m getting all too familiar with. I have over 4,000 individual web pages on my South Dakota Birds website. Of all those pages, which page gets the most hits? During the summer months it’s generally not even close…it’s this blog post page from a few years ago, about a hummingbird trapped in my garage. Once a hummingbird is in your garage, it’s not easy to get them out. My garage, for example, is quite tall, with the ceiling height a good six feet above the top of the garage door itself. Once a hummingbird comes in a garage, their instinct to escape drives them to fly upwards. They really seem to have trouble seeing the open garage door as an escape, and instead seem to always fly up towards the ceiling of the garage. For us, we’ve had two hummingbirds trapped in our garage over the years, and in both cases, we weren’t able to get them out until they were quite tired from flying around trying to escape. Then we got them to cling to a feather duster while we slowly moved them down and out the garage door. Other people have had some luck luring them down with flowers, hummingbird feeders, or some “red” item that grabs their attention. And that is the problem in the first place…their attraction to the color red. The item in the picture below may be the most dangerous item for a hummingbird that you have in your entire house or yard. This is the manual “pull” on a garage door opener, what you use when the power goes out and you want to manually close or open your garage door. The problem is quite simple…garage door manufacturers seem to love making these items red in color. Hummingbirds strongly key in on the color red, associating it with flowers, and thus, nectar for feeding. If a hummingbird goes past an open garage door and sees a red item dangling down, just that attraction to the color red may cause them to enter the garage and check it out. Once inside, if you have a garage with a ceiling higher than the top of the garage door, they tend to get “stuck”. We have multiple hummingbirds around our yard from early May through late September. However, with one simple change in our garage four years ago, we haven’t had any hummingbirds inside our garage. That change? Simply taking the red pull off the garage door opener and changing it to a black item. 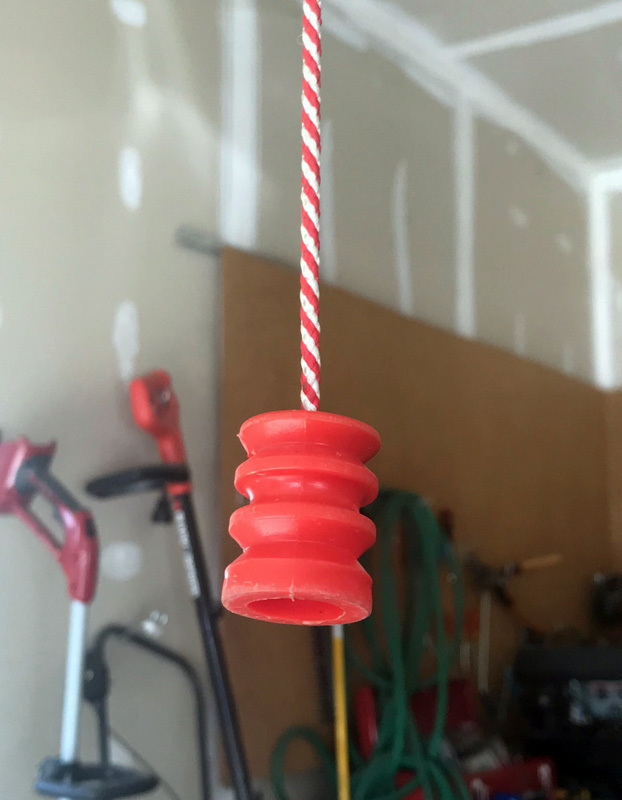 When I went over to my neighbor’s garage this afternoon, I knew what I would find…red garage door pulls. Given how difficult it can be to get a hummingbird out of your garage, the best advice I have…prevent their entry in the first place. Check your manual garage door pulls. If they have a red pull, take it off and use a neutral colored item in its place. A typical red “pull” on a garage door opener, for release and manual movement of the garage door. So many manufacturers seem to use bright red pulls such as this. With an open garage door, this is a huge attractant to hummingbirds, who are very easily “trapped” in a garage once they are inside.